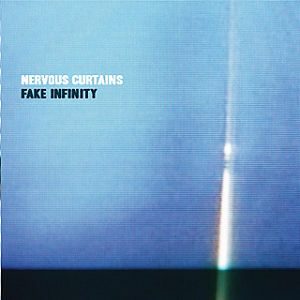 Nervous Curtains – Fake Infinity | NoCoda. What It Sounds Like: A blend of synth-rock and post-punk, but for dark, lonely nights rather than upbeat anthems that the likes of Radiohead or Muse might get into. I mean, these dudes make Interpol seem happy! What we have here is a disjointed collection of tracks that would fit in some dystopian future full of mysterious men, random scavengers, and vials of fluid that may or may not include tracking devices. Simply seeing the words Fake Infinity will always make me think of Godspeed You! Black Emperor’s debut record, F#A#∞. It doesn’t sound the same, no – not by a long shot. We actual have vocals, and the this isn’t any form of post-rock. But the similarity in the titles, and the uneasy nature of both releases, certainly could link them as distant cousins. There are heavy neurotic overtones to this record. It feels as if something is simmering under the surface, and not that it is about to explode, but that it is simply laying in wait to show itself in all its horrific features. It’s The End Of Eternity exhibits this mindset in plain-clothes fashion. A haunted church organ encompasses us halfway through, and keeps us on the edge of our seat. The single Wired To Make Waves is a subdued post-punk horror jam where spirits float throughout the mangled world that has become the protagonist’s home. It’s not a terrible outing, but you can’t help but sense that these three gentleman are trying extremely hard to fit into a certain category of music and off-center persona, and hold nothing back from it. It’s a positive and negative trait in the same sense. It’s positive because they really do have a unique, and at times, almost catchy (take that in the lightest sense) way about their writing. It’s negative because, it’s almost too much of the same to fill a record up with. I don’t know the time or place that I’m going to crave this – you can’t be this kind of dark all the time. I mean, it’s raining outside right now while I write this as 12 noon, and there’s no sun in the sky. Here I am, reviewing Nervous Curtains, and all I want to do is throw on some Huey Lewis & The News to pick my spirit up. I don’t want to think about the freaking spirit dwelling behind the moth-eaten curtain in the corner window swaying in the…breeze. The final track, Letter Of Resignation, commands us to kill your dreams before they kill you, and speaks of being tired all the time. I don’t know about you, but I’m gonna need something to bring me back in touch with reality after this one. I don’t feeling like offing myself quite yet. This mood is a little too dense for me.